Crystal FLOW for C 4.60 free download. Crystal FLOW for C allows you to create Flowchart from Source Code with one click. Crystal FLOW for C allows you to create Flowchart from Source Code with one click. Get a clear view of the code with Flowcharts. Inherited legacy code? A new member of the team? You will be up to speed in significantly less time. Automatic-Formatting of Code and Comments. More than just indenting and line wrapping. Line up object-names in successive declarations. Function call/caller info - a tree and a graph views. Software Metrics - McCabes, Halstead, OO Metrics ... HTML documents of source+comments (Javadoc like!) - both file-based and class-based. Reading a 50-line function or a 500-line function? Split and indent long expressionsas per operator precedence and a lot more . . . Processor : Pentium class processor. Display : 1280x1024 recommended with 256 color display adaptor. HTML Browser : IE 5.0 or above. Crystal FLOW for C++ is a useful application that lets you to create flowcharts from Source Code with one click. Crystal REVS is a useful program that allows you to create Flowchart from Source Code with one click. Code Visual to Flowchart is a source code flowcharting tool, help developers to document source code. 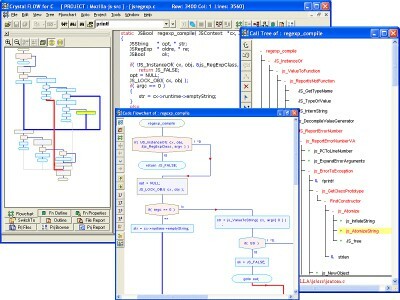 Code Visual Editor is a source code editor integrating code browser, analyzer and documentation generator with code flowcharting and visualization. Code Visual for C/C++ is a C/C++ Code Browser integrating program code analyzer, editor and documentation generator with code flowcharting and visualization. AgFlowchart is a great utility for generating flowcharts from your sourcecode.